According to an historical legend, on 31 October 1517 in the University town of Wittenberg in Saxony, an Augustinian friar and biblical scholar Dr Martin Luther posted the document which later became known as “The 95 Theses”. This document raised questions about the indulgence campaign which was being promoted by the Archbishop of Mainz and Magdeburg to raise money for the rebuilding of St Peter’s Basilica in Rome. This scholarly document ignited a movement that became known to history as “The Protestant Reformation”. The Jewish Christian Muslim Association (JCMA) was founded in 2004 as a safe meeting place for Jews, Christians and Muslims. Last year, in the context of growing tensions in the community, JCMA held its initial “Friendship Walk”: a visible demonstration of friendship open to the whole community. The program for the walk was to gather at a Christian venue (St Peter’s Anglican Church, East Melbourne), then move to a Jewish venue (East Melbourne Synagogue) and to conclude at a Muslim venue (the Albanian Mosque in Carlton). At each venue the host priest, rabbi and imam welcome us with prayer and some experience of their culture and community. In 2015 the event attracted just over 100 people from all three communities. Last Sunday afternoon, 6 November at 2pm, JCMA held this event again, this time attracting 200 people from Jewish, Christian and Muslim communities – plus many other faith groups and community organisations and members of the public. On Wednesday 22nd October 2014 the Ecumenical and Interfaith Commission hosted a public event to celebrate 50 years of Catholic ecumenism since the Second Vatican Council issued the Decree "Unitatis Redintegratio". The celebration took place at the Catholic Leadership Centre, and the special guest was Prof. Catherine Clifford, PhD STL. On 1 January 2011, Pope Benedict XVI announced that he wished to commemorate the 25th anniversary of the historic meeting that took place in Assisi on 27 October 1986, at the wish of Blessed Pope John Paul II. On the day of the anniversary, 27 October 2011, the Holy Father held a Day of reflection, dialogue and prayer for peace and justice in the world, making a pilgrimage to the home of Saint Francis and inviting fellow Christians from different denominations, representatives of the world’s religious traditions and, in some sense, all men and women of good will, to join him once again on this journey. 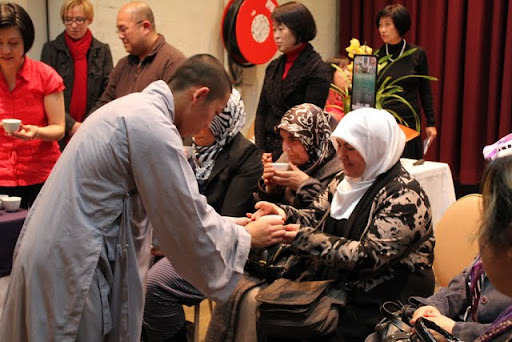 On the 25 June, 2011, the Chan Meditation Centre, together with the Ecumenical and Interfaith Commission and the Victorian Multicultural Commission, presented "Observing Tea", an event which introduced Melbournians to the wide variety of tea ceremonies from South East Asia. The “big event” for the Ecumenical and Interfaith Commission in 2008 was, without a doubt, the “Interfaith Youth Pilgrimage” on Sunday 13th July. To coincide with the visit to Melbourne of 25,000 international pilgrims en route to World Youth Day in Sydney, the youth of various religious communities in Melbourne came together “on pilgrimage to one another” in order to make a joint commitment to peace. Twelve communities were represented in this event: Baha’i, Christian (both Protestant and Catholic), Muslim (from both the Islamic Council of Victoria and the Australian Intercultural Society), Jewish, Hindu, Buddhist, Brahma Kumaris, Sathya Sai, Sikh and Indigenous. The event was jointly planned by the young people from these communities themselves. On March 13, 2008, for the first time, Catholics hosted Muslims to commemorate the Noble Birth of their Prophet Mohammed (pbuh). The evening coincided with the beginning of Holy Week for the Catholics. The theme for the evening was "The Servanthood and Submission of Jesus and the Prophet". The program was in two parts, each part containing a reading from the sacred text, a presentation on the theme, and some music and singing from that religious tradition. On August 21, 2007, ninety people gathered at the Cardinal Knox Centre in East Melbourne to attend the launch of the Archdiocesan guidelines for parishes, schools and agencies to assist in the promotion of interfaith relations. The guidelines, Promoting Interfaith Relations; Some guidelines for parishes and agencies of the Catholic Archdiocese of Melbourne , were developed by the Ecumenical and Interfaith Commission and approved by the Archbishop. Bishop Christopher Prowse, Auxiliary Bishop of Melbourne gave the key note address. The gathering was also addressed by Dr Paul Gardner of the B'Nai B'rith Antidefamation, Mr Yassar Soliman of the Victorian Multicultural Commission; Venerable Carolyn Lawler of the Tara Institute and Swami Shankaranda of the Shiva Ashram. Following speeches Archbishop Denis Hart officially launched the guidelines by commending them to the Episcopal Vicar for Interfaith Relations, Monsignor Peter Kenny.